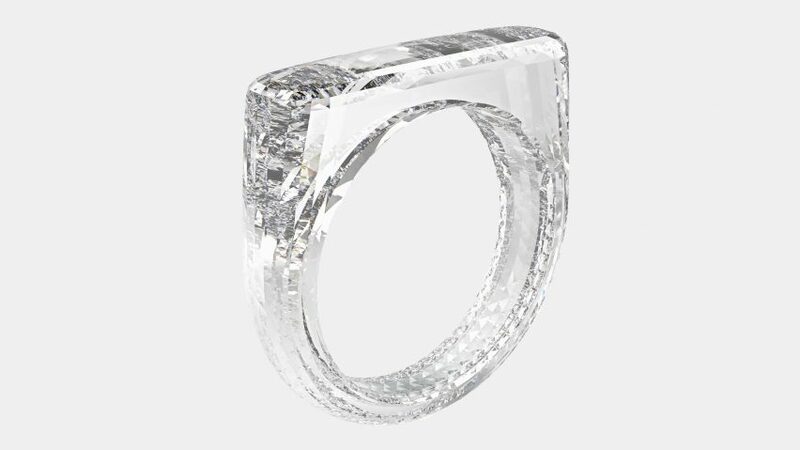 Apple design head Jonathan Ive and renowned designer Marc Newson are creating a ring entirely from a single diamond for sale at a charity auction. Produced exclusively for an upcoming (RED) charity auction at Design Miami on December 5, the ring will be completely diamond without the traditional metal band. Instead, the interior cylinder of the ring will be smoothly cut out of a single diamond using a laser guided by a micrometer-thick water jet. The finished ring will have between 2,000 and 3,000 facets — according to auctioneers Sotheby's, the most ever seen on a single piece. Some of these facets will be just a few millimetres in size. "Consistent with their mutual obsession with transforming raw material into objects of value, Ive and Newson's design is singular, clear and un-compromised by the traditional metal settings and bands that have previously been required to create 'diamond rings'", said Sotheby's. "It will be created by removing material rather than adding — an ambition made possible by the extraordinary scale of the stone which will enable the ring to be completely made of this material." The (RED) Diamond Ring will be created by Diamond Foundry, a San Francisco-based diamond producer that uses proprietary technology and is certified carbon neutral. It will be crafted bespoke for the buyer and made to fit up to a US size 5. Sotheby's estimate is that the ring will go for $150,000 to $250,000 (£117,000 to £195,000). Ive and Newson are friends and frequent collaborators who have worked together at Apple, where Ive is chief design officer. They also curated the last (RED) auction in 2013, for which they designed a one-off Leica camera, and put their own spin on a Christmas tree for London hotel Claridge's in 2016. Among the other pieces for auction on December 5 are unique metallic red versions of David Adjaye's Washington Collection Corona Coffee Table and Skeleton Chairs for Knoll, as well as a red-tinted take on Zaha Hadid's Liquid Glacial table. This is the third such auction organised by (RED), the charity started by U2 musician and activist Bono to fight HIV/AIDS. The live auction will be conducted on the evening of 5 December 2018 at the Moore Building in the Miami Design District. More than 50 works will be up for auction in total, and they'll be exhibited publicly at the same location from 1 to 7 December.